Chinook Jargon emerged in the 1700’s, when sailing explorers learned some native language in Nootka Sound and attempted to communicate with the population of various tribes in it. The local natives also curious and eager to trade, in turn adopted this vocabulary to talk with explorers. Many words from Chinook, other native languages, English and French were soon added and the jargon we know it to be. The term potlatch is Chinook origin. Everyday you hear someone say ah ha or e-eh. Another common term is Bos’ton which in carrier term is white man. La-hal or slahal is a bone game played by two groups. There is singing and taunting of who will guess where the marked bones are. The French word Mercie (Thank you) became Mussi in Carrier. Stellaquo is the central dialect of athapaskan language system. Athabaskan or Athabascan (also Dene, Athapascan, Athapaskan, Athabasca Indians or Athapaskes) is the name of a large group of closely related indigenous peoples of North America, located in two main Southern and Northern groups in western North America, and of their language family. The Athabaskan family is the second largest family in North America in terms of number of languages and the number of speakers, followed by the Uto-Aztecan family which extends into Mexico. In terms of territory, only the Algic Language family covers a larger area. The word Athabaskan is an anglicized version of the Woods Cree name for Lake Athabasca (aðapaskāw, “[where] there are plants one after another”) in Canada. The name was assigned by Albert Gallatin in his 1836 classification of the languages of North America. He acknowledged that the name for these related languages was entirely his own individual preference. Albert Gallatin’s arbitrary designation has unfortunate connotations as “Athabascas” describes a shallow, weedy lake. “Athabaskans” prefer to be identified by their specific language and location. Below is an outline of the family showing only the major branches of the family. This outline follows mostly the classification of Keren Rice as seen in Goddard (1996) and Mithun (1999). Branches 1-7 are the Northern Athabaskan (areal) grouping. Kwalhioqua-Tlatskanai (#7) has often been considered part of the Pacific Coast grouping, but a recent consideration by Krauss does not find it very similar to these languages. At this time, the details of the Athabaskan family tree should be regarded as tentative. 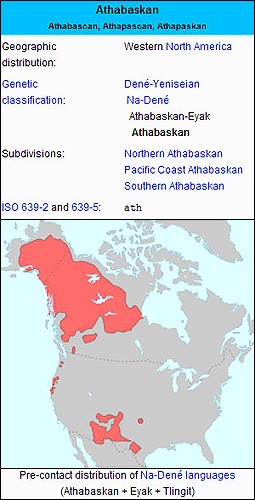 For detailed lists including languages, dialects, and subdialects, see the respective articles on the 3 major groups (that is, Northern Athabaskan, Pacific Coast Athabaskan, Southern Athabaskan).Lake Babine is the northern dialect, Stelakoh central dialect and Saikuz is the southern dialect.